Plants? - can you tell me what plants are shown here? There are many kinds of plants here, but most visible are rose glow barberry, japanese silver grass, gold fountain sedge, karly rose fountain grass, chocolate snakeroot, and giant feather grass. Planning Your Landscape Protect your home and property by incorporating fire safety guidelines and “buffer zones,” called defensible spaces, during the landscape design planning stages and beyond. These guidelines usually include the use and proper placement of fire-resistant plants and trees and other fire-resistant materials that you can incorporate into the landscape areas surrounding your home. Creating defensible spaces is also critical for safe access by firefighters. 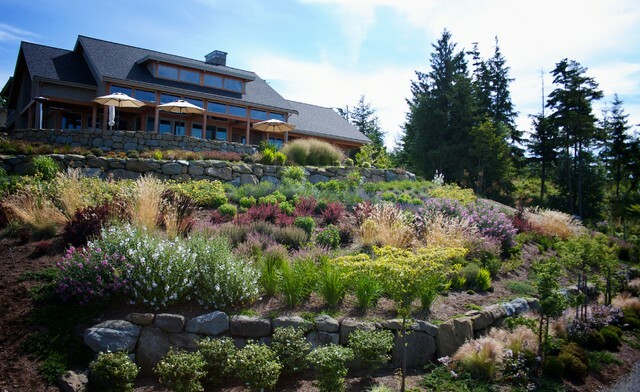 A great example of the variety of the placement, color and texture we'd like in the hillside plantings.